Image courtesy of the Goodman Gallery, South Africa. 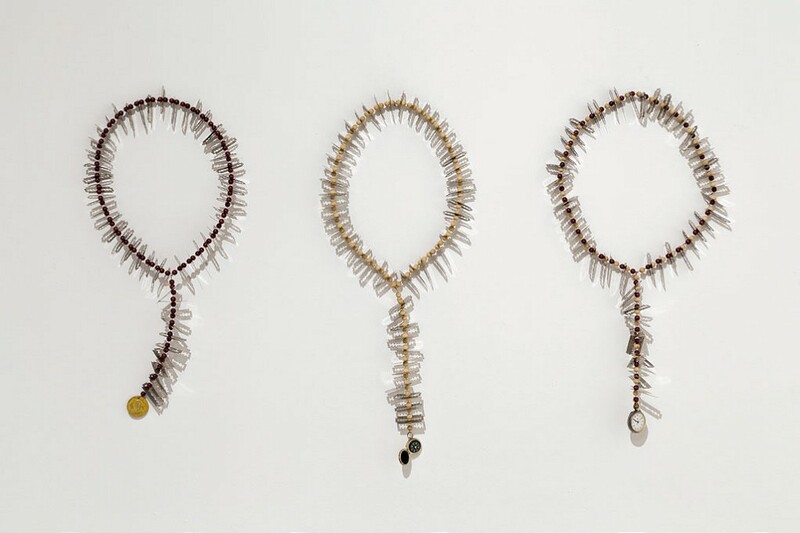 ‘Johan Thom’s work Recital (lend me your ears) consists of three prayer bead necklaces each fashioned from wooden beads, music strings and fifty individually engraved razorblades. Like a real set of prayer beads, the object is made to be handled as part of a highly personal, meditative reflection. The work exists as a silent symphony playing out in the mind of the viewer, and is constructed from the artist’s personal history as an immigrant from Europe. Thom states “this symphony has as much to do with my family, religion, as with war and the discovery of gold in Southern Africa in 1886. But more sinister meanings are present here: The appearance of sharp blades on the necklace serve to remind of the actual collection of ears as trophies by soldiers during the colonial wars in Africa. Instead of a crucifix each prayer bead terminates in another object associated with the larger history by and through which my identity is constructed.” As with Kentridge’s film, where the complete image exists only in the mind of the viewer, Thom’s violent heritage is replayed in the mind of each viewer who interacts with the components of the artist’s inherited history’. (Excerpt taken from the press release for the group exhibition ‘Surfacing’ held at the Goodman Gallery, Cape Town 2013).